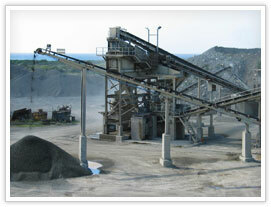 The 350 Ton/H ore crushing, screening, conveying and stockpiling plant for at their Syferfontein Colliery, near Secunda. The machines included vibrating feeders, a pe jaw crusher, vibrating grizzly feeder, screen, rotary crusher and stockpile reclaim vibrating feeders. This system includes approximately three kilometers of conveyors transferring the raw materials from the existing and new stockpiles into the plant. The raw materials include various grades of manganese ore, ore, coke and quartzite. In addition, the existing final product handling and silo conveyors will be upgraded and a new dump truck loading facility installed.